The combined activities of the Industrial Internet Consortium and Industrie4.0 alliance, culminating in the much expanded IoT Solutions World Congress in October seem to have given significant impetus to IoT adoption in the industrial sector. In several of my discussions over Q4-2016, I witnessed growing evidence that corporate executives have tasked their business development and strategy teams to formulate plans to integrate IoT more closely into their core operations. The IoT takes most industrial organizations into a new operating domain and requires a process of self-education to begin with. Most of the questions I encountered began around the two topics of connectivity technology choices and approaches to justify the IoT business case. There remains a tendency for organizations to think in terms of single-purpose applications and to conceive of bounded solutions over which they retain full control. There is some recognition that interoperability will be important in the future although what it means how it translates into business value are unclear. This should not be a surprise since the majority of industrial companies are dealing with completely new ways of doing business using technology and techniques plucked from other business and telecommunications-services sectors. A major challenge for industrials is to plan their strategies and business-cases with the right frame of reference. Much like navigating with a map, the best way to make significant progress involves zooming out to see the bigger picture. 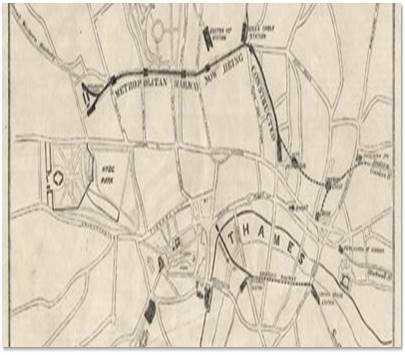 Taking a note from history, a good example is the development of London’s Underground system. In 1863, the Metropolitan Railway created the first stretch of today’s underground system. 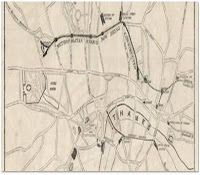 Then, investors were beginning the world's first underground railway between Paddington and Farringdon Street. Their challenges most likely included underground engineering techniques and locomotion using wooden carriages and steam locomotives. When we fast-forward to the modern day underground, it includes an interoperating family of railway lines, shared facilities (depots, stations, cross-system ticketing etc. ), and, new business models (inter-modal transport solutions between buses and trains, advertising services, electronic payment alternatives etc.). It is unlikely that the Metropolitan Railway pioneers had any notion of such longer term possibilities. Today's industrial organizations don't have the luxury of time. The IoT is very likely to follow a similar evolution in new services and business model innovation  as the underground. However, the pace of technology development is such that the 150 years it took for the hardware-intensive underground to evolve into its modern form might easily shrink to a 10-15 year interval given the software and services-intensive nature of the IoT sector. Against the backdrop of such a fast-developing scenario, the implications for industrial IoT adopters are profound. For example, underground engineering, tunneling and trains are proxies for the elements of connectivity in the IoT world; IoT users should not treat these as the innovation frontier when developing their strategies. Instead, the standardization of connectivity, the lowering of costs associated with connectivity and the integration of connectivity spanning multiple access media become basic and fundamental building blocks in the IoT value stack. The focus of innovation as it relates to new technologies, operating procedures and business models shifts to the upper layers of the IoT service stack. Beyond this, there will be additional sources of value from interoperability, across application silos and organizational boundaries. Thus, a supplier of industrial testing equipment for factory environments may begin by creating IoT solutions that deliver finer grained and actionable information for different types of high-value machines. As these application concepts take hold across the factory environment, the factory manager will want an integrated view. This means a machine-monitoring and control solution that spans all equipment and machinery types from different suppliers. It is unlikely that any one supplier will succeed with a closed solution or a silo IoT application over the long term. The strategic IoT challenge is to plan an evolutionary path that delivers simple industrial IoT solutions early, providing value to the end user while helping the supplying organization to master new capabilities and service-support business models. Beyond this early phase, the supplying organization needs to chart a path to interoperability. This will involve some form of industry-standards approach. Hardware and communications standardization may be the first step in this process. As the London Underground example illustrates, longer term areas of standardization will apply to the services and interactions that the underlying network supports (inter-modal journeys, payments etc). For the IoT, this corresponds to standardization in areas such as data exchanges, semantic interoperability and monetization of low-value transactions. Similarly, the London Underground example highlights the business case challenge of creating a baseline solution that can accommodate interoperability and relatively rapid advances in innovation without entirely wasting early stage investments in proprietary or closed-solutions.